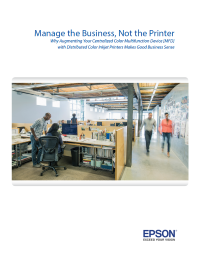 Download this paper to learn how implementing a hybrid printing solution can slash hidden costs and inefficiencies in your organization. Moving your IT workloads to a centralized multifunction color printer can improve cost and efficiencies in any organization. Inkjet printers from Epson restores control and quality to your workflow capabilities.